I love butternut squash soup. There’s a savory sweetness to it that’s like nothing else. 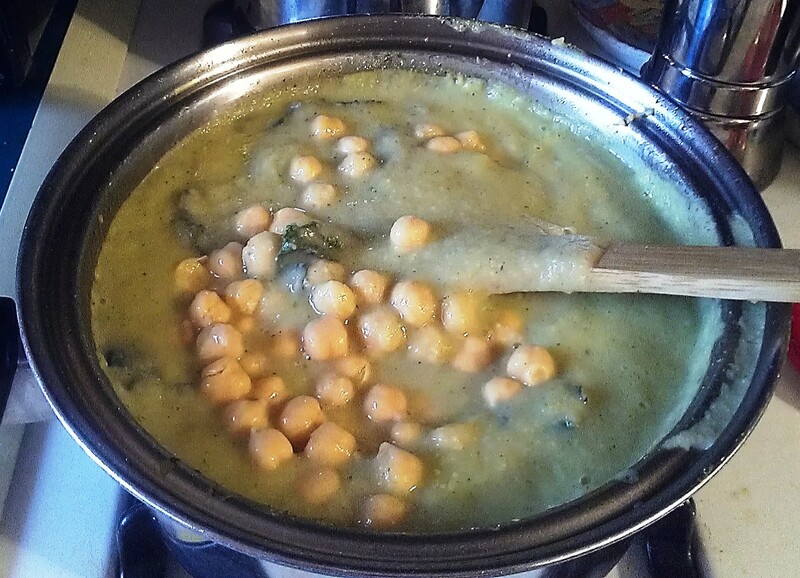 There are various ways to make it—smooth or chunky; with only broth or with cream; cream or almond milk; plain or with other ingredients, such as greens or beans; etc. 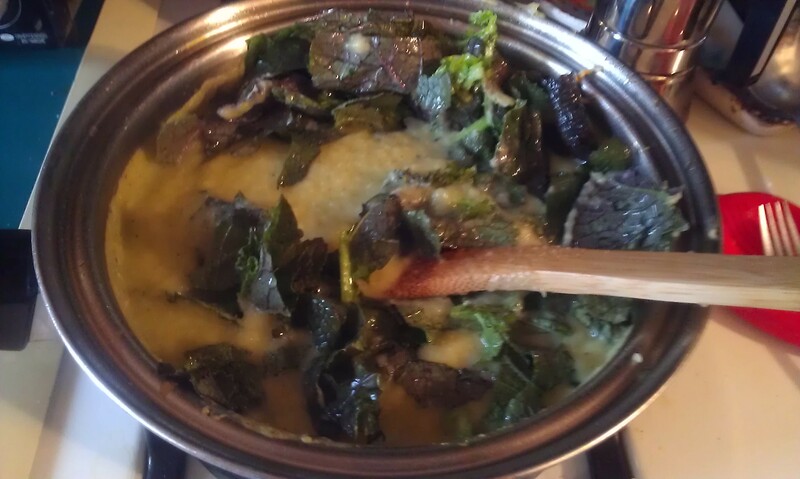 I chose to make this batch a plain bisque with only broth…but with additions. I decided to try roasting snow peas because roasting is my favorite way to prepare vegetables. I’d never roasted snow peas, however, and had no idea how they would turn out. I was pleased at the result. They have a roasty smokiness with just a hint of a pleasant bitterness. I thought they would make a nice topper to the bisque. And caramelized mushrooms? I don’t really think I need to sell that. Heat 1 tablespoon of the oil in a medium saucepan. Add the garlic and sauté until fragrant, about 1 minutes. Sprinkle in the paprika. Add the squash and 1 teaspoon of the salt and cook, stirring occasionally, for 3 or 4 minutes. Pour in the broth. Bring to a boil. Lower the heat to medium-low and simmer until the squash is tender, about 20 minutes. Meanwhile, combine the snow peas with 1 tablespoon of the oil and one teaspoon of the salt and spread them out in a baking pan. Roast until nicely brown, about 20 to 25 minutes. Stir them halfway through cooking time. Heat the remaining oil in a medium skillet. Add the mushrooms and remaining salt. Sauté over medium-high heat until the mushrooms are golden brown, about 20 to 25 minutes. They will release water after about 6 or 7 minutes; after the liquid evaporates, the mushrooms will begin to brown. When the squash is done, puree it by either with a stick blender or by putting the contents of the saucepan into a blender. Stir in the black pepper. 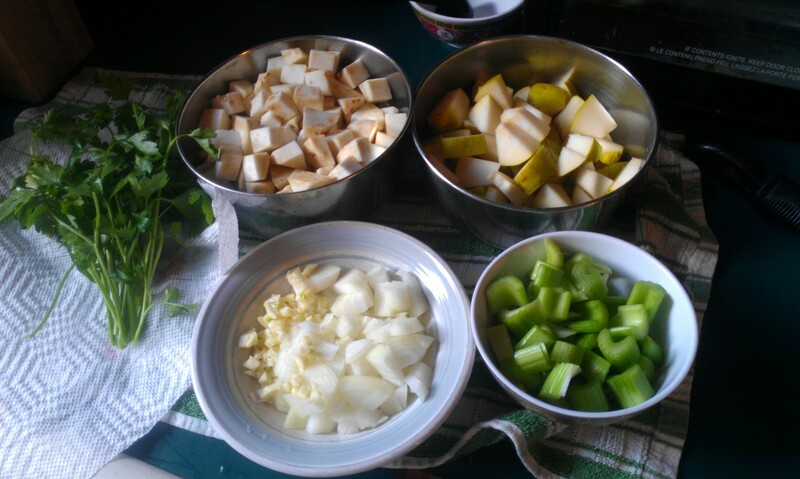 Taste the soup for seasoning and adjust, if necessary. Ladle the soup into 2 bowls. Arrange some of the snow peas and mushrooms on top and serve. Categories: Gluten-free, Healthy eating, Recipes, roasting, Savory Cooking, Soup, Uncategorized, Vegan, Vegetables, Vegetarian, Wheat-free | Tags: bisque, butternut squash, mushrooms, roasting, savory, snow peas, soup, vegetarian | Permalink. I had no plans for cauliflower over the course of my very busy weekend, but when I saw big, beautiful heads of cauliflower in the store the other day, I couldn’t resist buying one. 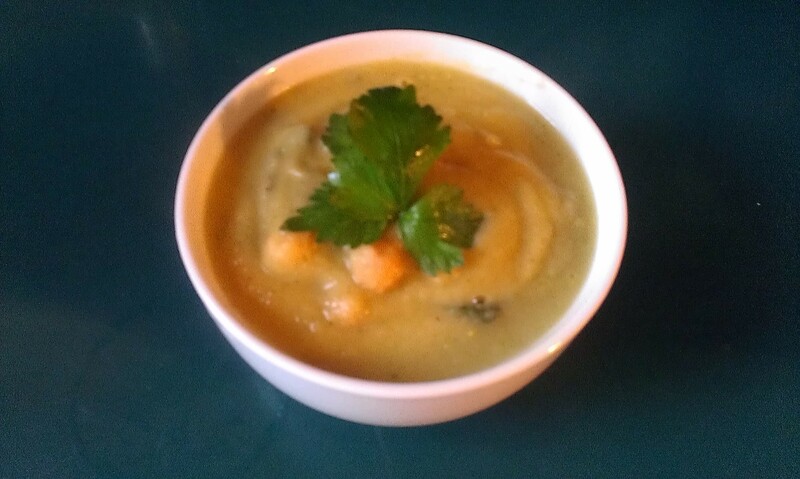 It’s cold, snowy, wintry weather, and days like this just scream soup, and what I wanted was a creamy bisque. But before I get to my recipe, let’s talk a bit about this wonderful cruciferous vegetable. Categories: Gluten-free, Healthy Alternatives, History of Food, Recipes, seasonal cooking, Soup, Uncategorized, Vegan, Vegetables, Vegetarian | Tags: bisque, cauliflower, soup, vegan, vegetarian | Permalink. 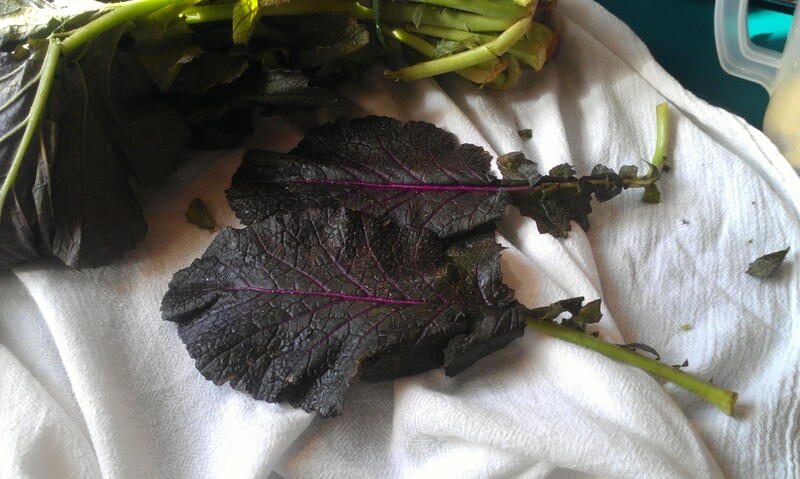 This week’s catch at the farmer’s market was a nice big knob of celeriac and red mustard greens. I’ve had celeriac (also known as celery root and knob celery) before, and I’ve really enjoyed it. It has a great celery flavor to it, but a little sweeter and more intense. It also has parsley notes, and that’s because it’s part of the parsley family, and not the root of the celery plant. Like other root vegetables, it has a long shelf life (6 to 8 months in a cool place). Celeriac is not a beauty queen, and many Americans have no clue what it is or what to do with it, but it’s a flavorful addition to anything. You can cut them up and roast them. You can add them to chilis and stews. Or you can do what many chefs do with them, and what I’ve done for the recipe below: make a bisque. It’s wonderfully creamy when pureed and combined with either apples or pears, it has a rich, complex flavor. They’re good for you, too. 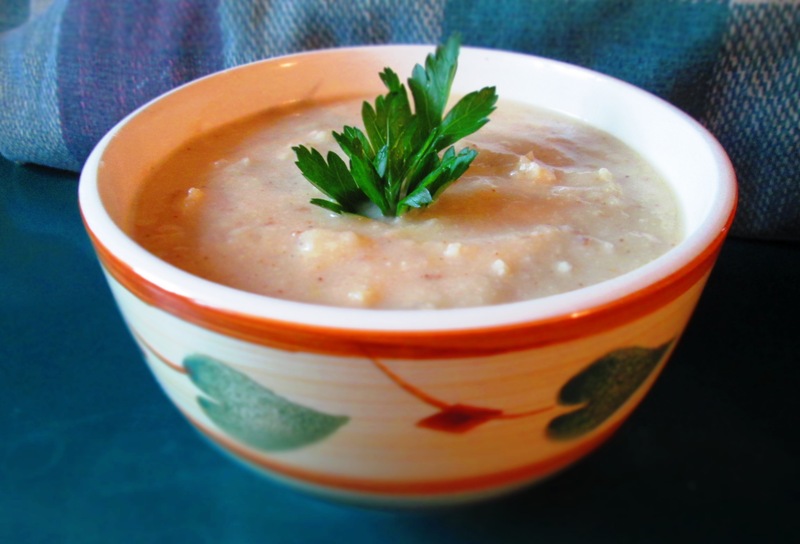 Celeriac contains antioxidants, and is very a good source of vitamin K, phosphorus, iron, calcium, copper (good for the immune system, prevents anemia, and required for bone metabolism), and manganese. And it contains some B-complex vitamins, such as pyridoxine, pantothenic acid, niacin, riboflavin, and thiamin, and some vitamin C.
The red mustard greens are new to me, though. They are Chinese in origin, but are also cultivated in Japan. They’re lovely to look at and just as nutritious as other mustard greens, all part of the Brassica family, along with broccoli, cauliflower, cabbage, turnips, etc. 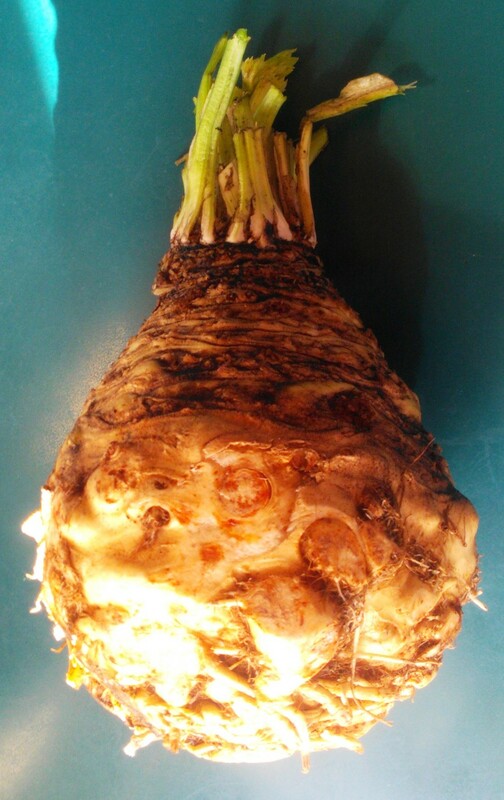 Celeriac is not found everywhere simply because they are an unfamiliar item for many people. But most larger stores, like supermarkets, carry a few, as do gourmet stores, and, of course, farmer’s markets. Enjoy! Heat oil in a medium-large sauce pan. Saute onion and garlic until translucent. 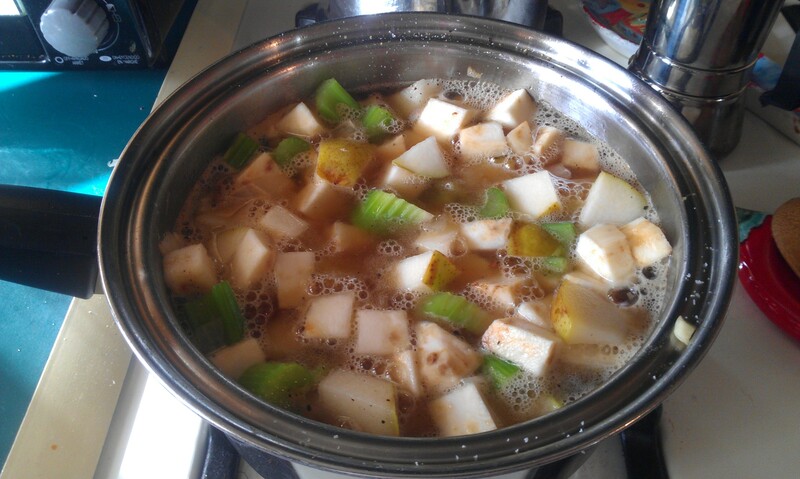 Add celeriac, celery, apples or pears, and salt and saute another 5 minutes. 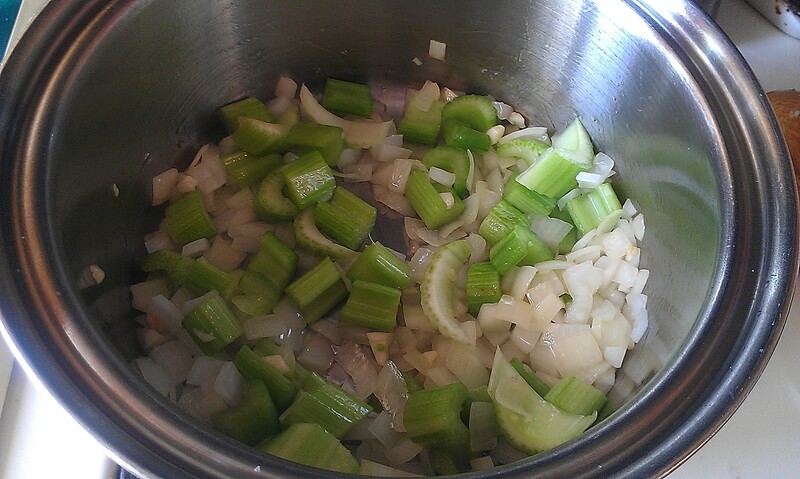 Pour in broth and bring to a boil; lower heat and simmer until vegetables are tender when pierced with a fork. 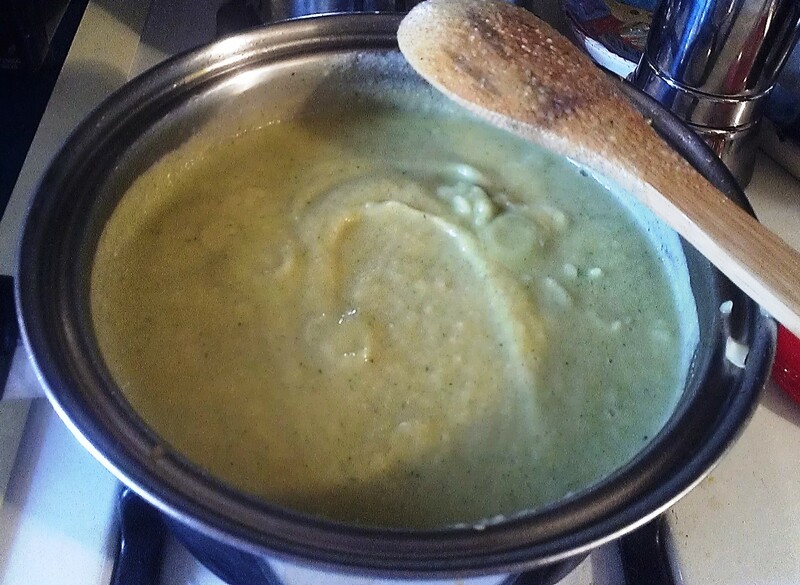 Transfer to a blender; add parsley and puree (the soup is hot so be careful to hold the lip of the blender with a hand towel. Pour back into pot. (Alternatively, you can add parsley to pot and use a stick blender). Add fresh pepper, mustard greens, and chick peas. Cook another 5 minutes. Check for seasoning and serve. Sprinkle parsley on top for garnish. 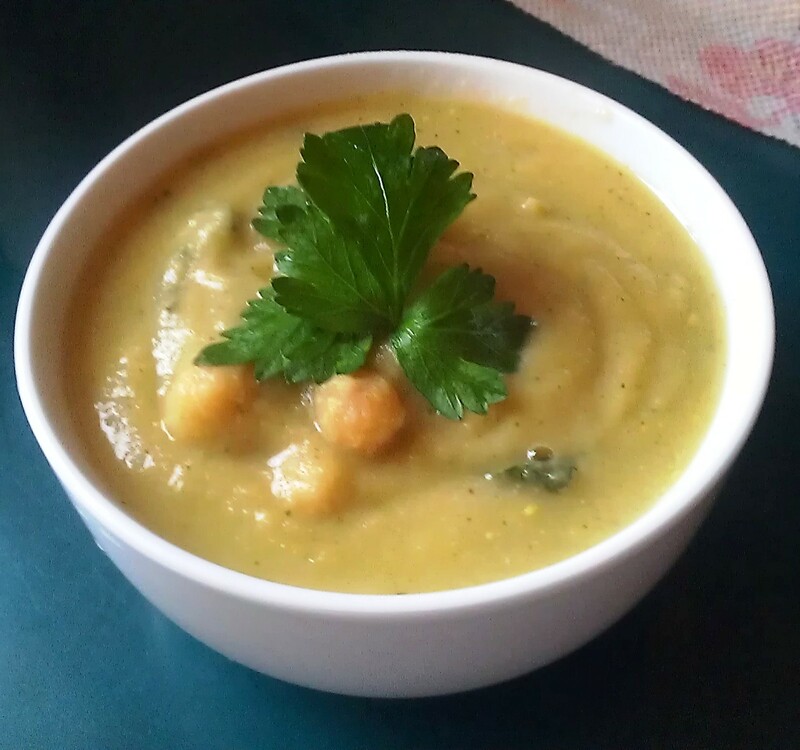 Categories: Gluten-free, Healthy eating, New-to-me Food, Recipes, Savory Cooking, Soup, Uncategorized, Vegan, Vegetables, Vegetarian | Tags: bisque, celeriac, celery root, chick peas, chickpeas, mustard greens, soup | Permalink.